NEXT MEETING: March 11, at 7:30. Program: Getting ready for our tuber sale. There may be some snazzy dahlias for sale just for meeting goers from Lou, Pat, Devi and Deborah. Will you bring special tubers or plants, too? Who will bring treats? Devorah led a hands-on cutting lesson from pot roots she’d planted from cuttings last year. She showed how she snipped the green shoots off the tiny tubers and slipped them into Rapid Rooter plugs from General Hydroponics, after plumping the plugs up in water overnight. Then she spritzes them and pops them under lights in her garage greenhouse. Deborah sold ADS Classification Books so that Frank could explain them. Frank walked us through many sections of the ADS Classification Book, which he described as “a Swiss Army knife. It has so many different tools and uses.” He added, “It helps you pick the winning ponies.” Deborah followed up with the quiz later on in our newsletter to test if you know your way abound our most important book. Deborah explained about potting up dahlias in milk cartons and putting them in the warmest area of your home, the loft, around the hot water heater, on top of the refrigerator or???? Do NOT water these milk cartons; the tubers have no roots to absorb liquid. Wait until you see actual green shoots before you begin giving them small amounts of water. Frank added that he uses yogurt containers instead of milk cartons. DSC’s two Flowers of the Year are Skip to My Lou and Mathew Juul. EVERYONE –even people living in apartments—should grow a Mathew Juul. It’s a mignon single, happily growing in a pot on a sunny balcony. Look for it at our tuber sale. Tinnee showed us all the poster she designed for our tuber sale. Download it HERE. Put it up on Facebook for all your friends to repost. Print it out and pin it up at work, in your doctor’s office, at the local nursery, wherever you think gar- deners might see it. Frank delighted us all with a fun raffle to conclude our evening. Lucky people won Sluggo and snazzy scissors. Wow. How wonderful to see the lovely cuttings out from the greenhouse: AC Ben, Clyde’s Choice, Black Monarch, Snojo Storm, Hollyhill Cotton Candy, Felida Solar Flair, and Hapet Blue Eyes. Deborah donated AC Abby, Clearview Magic and Britany Rey. Even though she’d shattered her ankle, Maggie sent her husband in with tubers including Pooh. Ron and Joann put in a surprise appearance with a HUGE box of Meyer’s lemons. Mmmmm Thanks to John and Annette for the almond biscotti, and to Maggie for the fabulous truffles. Devi’s macarons and Tom and Chad’s different puddings proved yummy. Thanks, too, to Devi for the lovely iris rhizomes. Please sign up at our March meeting or contact Deborah dahlia.dietz@gmail.com. Arrive by 7am. The Powers That Be promise to have the gate unlocked by then. Please bring your extra tubers and plants to contribute to our sale. We may be way short due to the rain rotting many clumps and the cold slow- ing down greenhouse production. This is our big opportunity to earn the funds to pay for our meet- ing and show room. Bring your ADS Classification Book, a black, red or blue Sharpie and optionally a magnifying glass to spot eyes on burgeoning tubers. We need to sort tubers by size and name; tag cultivars; match photos with plants; and stand up table signs. IF WE FINISH BY 9:00, we’ll give volun- teers– who’ve helped the entire time– advanced shopping time before we let the public race in at 9:30. Remember to bring a delicious dish to share with your fellow DSCers at our celebratory potluck lunch. After the public arrives, we’ll need counters, membership table ambassadors, exit pollers, and person- al shoppers/buying guides to hook up new dahlianeers with appropriate cultivars. 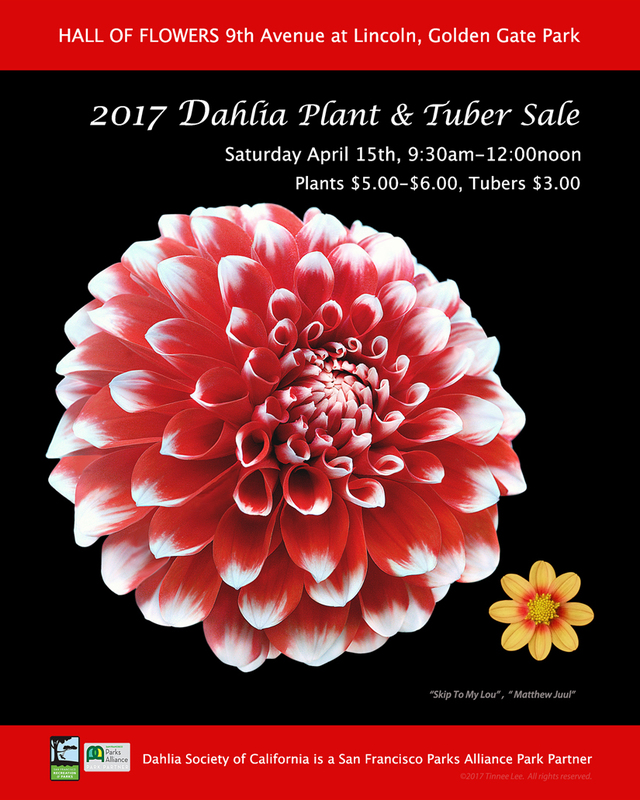 This is a major way you can support your Dahlia Society of California. This photo essay takes you through all the steps in my little slanted driveway. at the beautiful eyes exposed after a relaxing soak. Alan Hass in North Carolina uses a compressor blower to gently blast off excess garden soil. Secondly, I use my Dremmel oscillater with its 3/8” blade to divide the clump. Some- times, I put a knife down the center of the stem to break the conglomeration in half first. When things are gnarly, I sometimes jiggle them underwater and they fall apart like a Japanese puzzle. Sometimes I discover sprouts way in the interior of the mass. All the tubers take another dunk in 5-10% Clorox solution for @10 minutes. This doesn’t have to be in big 5-gallon buckets like we use at DigOut; as you note, I use a yogurt container. My penultimate step is dipping each tuber in sulfur. Lastly, I slash the side of a milk carton, write the cultivar’s name on the flap, half fill it with potting soil, and tuck the tuber in. Once the tuber is covered with more potting soil, the milk carton goes up to my loft to join its slumbering pals; the heat awakens them, causing them to germinate. When they are about 5” tall, I put them outside to harden off. Alas, the rain has forced my beauties to relax on my living room floor; from drought to deluge. Either I’ve grown dahlias for thirty years or I’ve grown dahlias once thirty different times. ???? When you count up all the steps and all the labor and all the exper- tise that results in a single viable tuber, $3 is ridiculously cheap. The Wardens cosset over 100 show dahlias and generously donate them all to DSC, with the proviso that we dig them up. John, Tony, Debby and Todd helped exhume them all over two beautiful albeit sprinkly days. We celebrated packing up the last one with succulent tangerines. Look for them at our Big Sale in April. Now that Frank has introduced us to the official ADS Classification Book, here is a quiz to test your skill. Describe the dahlia 3013: what is the size, form, color? How many varieties of 3013 won in 2017? Which 3013 won the most ribbons? How many? Did it win more on the East Coast, the West Coast or in MidAmerica? Extra Credit tricky question: How many higher than Blue awards did this out- standing variety earn? What does the # indicate? Which dahlia has been shown longer? Chilson’s Pride or Little Willo? When was each introduced? How many 8-10” orange informal decorative dahlias won blue or better in 2016? What is the abbreviation for our own Lou Paradise as a hybridizer? From where is the hybridizer of the Hillcrest dahlias? Which is the winningest waterlily? How many blues or higher? How many cultivars earned in the triple digits in 2016? I will bring answers to our April meeting. I’ll also print the answers in our May newsletter. DSC will have ADS Classification Books for sale at our Tuber Sale. TIME TO PLANT. YAY! Remember to have several things ready BEFORE you start to plant: stakes, fer- tilizer, labels, Sluggo, and a map of your kingdom. Then remember that tubers get planted and tended differently than cuttings. Tubers: dig your hole 6” deep. Add fertilizer and mycorrhizae. Stir up. Pound in stake BEFORE you place tuber. Then add tuber. Cover with a couple inches of dirt but do not fill to the surface. DO NOT WATER. Your tuber has no roots. If exposed to moisture, it will rot. You can turn a five gallon pot over the site to act as a mini green house. For downsizers, you can cut the bottom off a two-liter soda bottle and stand it up over the area where the eye should sprout. LABLE immediately. Cuttings: Same rules apply as for tubers up through implanting the stake. Then carefully plant your cutting so that two nodes will be below the surface eventually. This will ensure that you get tubers from your cutting in the Fall. If your cutting looks fragile, you might put a sleeve around it, such as a milk carton with the top and bottom cut off. This would protect the young dahlia from too much wind at its inception. WATER IMMEDIATELY. Cuttings have no tubers; they have hair thin roots. If a cutting dries out, it dies. Cuttings enjoy a little water EVERY DAY.